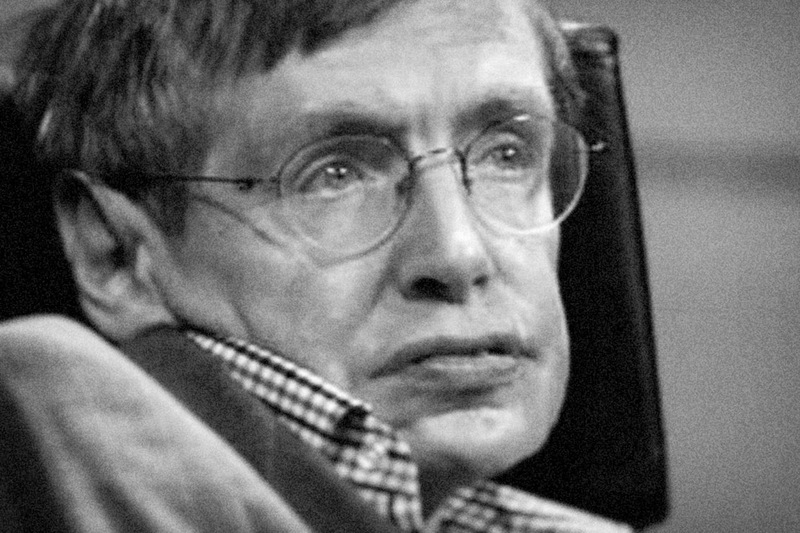 As ALS (Lou Gehrig's Disease) ravaged Stephen Hawking's body, his mind remained untouched. Though the portals of his eyes, he used it until his dying breath at the age of 76 on Wednesday. When diagnosed with the disease in 1963, he was given two years to live. I don't understand the science that he explored in his life. 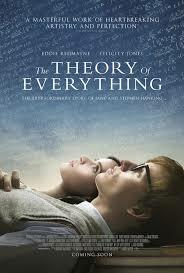 The idea of black holes, the nature of time, and the theory of everything are well beyond my abilities to comprehend. However, the fact that he captivated much of the world with his ideas and writings while being practically immobile and unable to speak is nothing short of remarkable. "I always thought he was American," I said to Heather as we started watching The Theory of Everything, the movie that came out about his life in 2014. He was, in fact, British, and was a graduate student at Cambridge. It turns out the machine that he used to communicate - it was the the "Equalizer" - produced the iconic voice that we now associate as being his. Even as new technology emerged, that would have given him limitless choices in terms of voices, he chose to stay with the original, as he (and everyone else) had grown attached to it. 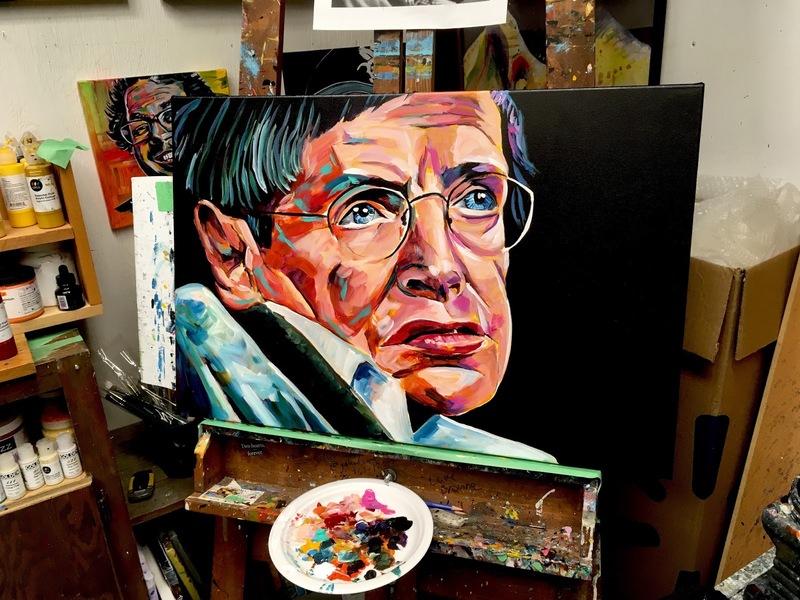 When you step back from the fine details and look at the life of Stephen Hawking at a distance, you would see a man with an absolutely debilitating disease who persevered, adapted, innovated, and moved forward everyday. Even as he lost his ability to move his fingers and hands, he worked with scientists to use the movement in his cheeks to communicate. I dived into the portrait of Stephen Hawking on March 14th, the day he died. 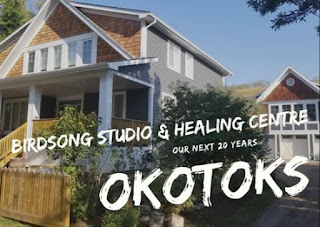 I finished it up on the following day. I was inspired by a comment made by one of my clients and the reaction I was observing from people around the world. I added the stars because I wanted to express the idea that he was always looking beyond, to the next big idea. This 20" x 30" original portrait is available for purchase. 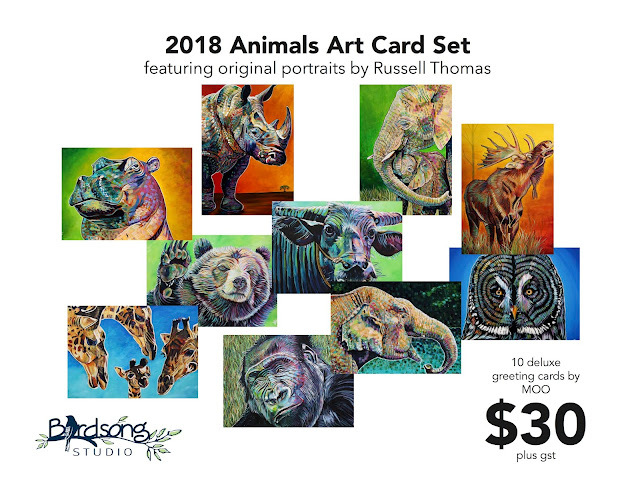 If you're interested, contact me through my Russell Thomas Art Facebook Page or email russell.thomas@birdsongconnections.com.